St. John’s NFLD – The Worcester Railers HC(3-6-0-0, 6pts) dropped their fourth straight game with a 3-1 loss to the host Newfoundland Growlers (8-5-0-0, 16pts) in front of 2,618 fansat the Mile One Centre on Tuesday evening. The two clubs battle again in St. John’s on Wednesday at 5:30pm (EST). 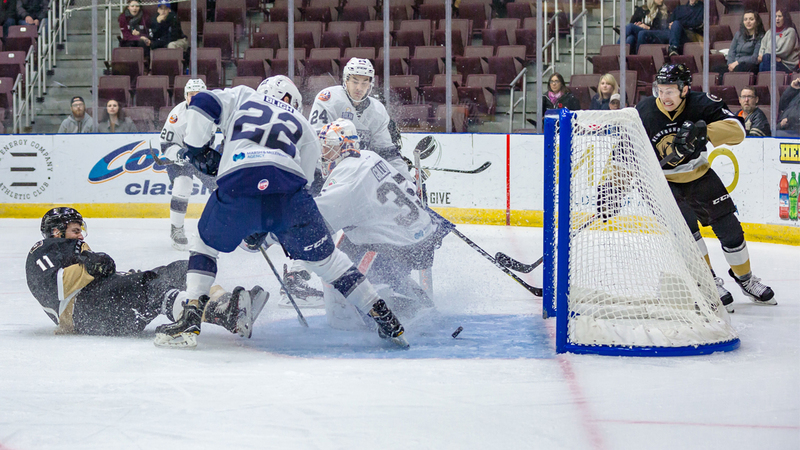 Josh Holmstrom scored his team leading fifth goal of the season while Mitch Gillam made 30 saves in his first start since his loan back from the Bridgeport Sound Tigers as the Railers offense has scored just four goals in their last four games. Rookie Josh Kestner scored twice for the Growlers while Michael Garteig made 30 saves as Newfoundland won their season high third straight game. Newfoundland went ahead in the opening period as Derian Plouffe (2nd) raced down the middle and had his initial shot stopped by netminder Mitch Gillam but the puck then went off a skate in front and past Gillam at 11:37 to give the Growlers a 1-0 lead. Worcester would even the score at 14:29 as Josh Holmstrom (5th) took a centering feed from Woody Hudson and then scored on his own rebound for his team leading 5th goal of the season. Shots were 13-7 through 20 minutes of play in favor of the Railers in a 1-1 hockey game. Neither team scored in the second period as shots were 12-7 in the middle frame in favor of Newfoundland as both goaltenders made some nice saves. The two clubs headed to the second intermission in a 1-1 draw. Josh Kestner (5th and 6th) got the game winning goal at 3:58 of the third period and added an insurance strike at 10:42 on the power play as Newfoundland pulled away in the final frame for the 3-1 victory. Notes: Three Stars: 3rd star: Kyle Cumiskey (0-0-0) 2nd star: JJ Piccinich (0-0-0) 1st star: Josh Kestner (2-0-2)….Final shots were 33-31 in favor of Newfoundland… Michael Garteig (6-4-0-0) made 30 saves on 31 shots for Newfoundland….Mitch Gillam (2-4-0-0) made 30 saves on 33 shots for Worcester with Evan Buietenhuis acting as the backup..….Worcester went 0-for-3 on the power play while Newfoundland went 1-for-4…. Tommy Kelley (inj), Yanick Turcotte (inj), Connor Doherty, Tommy Tsicos, and Ivan Kosorenkov (immigration) did not dress for Worcester…. Jeff Kubiak is currently on recall with the Bridgeport Sound Tigers…Mike Cornell played for St. John’s when the team was in the AHL…. Brian Arneson picked up his 1stfighting major of the season with a first period tussle with James Melindy…. Bally Almeida had game high seven shots on goal… Nick Bligh and Woody Hudson added assists for the Railers. The Railers battle the Growlers again on Wednesday at 5:30pm in St. John’s, NFLD. The Railers return home this Friday on COUNTRY NIGHT presented by NASH ICON with a 7pm faceoff vs. the Maine Mariners at the DCU Center. The first 1,000 fans will receive a Railers bandana presented by Nash ICON and Jack’s Abby along with a live performance by country artist and Railers season ticket holder Mychael David. The NASH ICON street teamwill also be in attendance.EVERY Friday is a 2-3-4 Friday with $2 popcorn, $3 sodas, and $4 Bud Lights in the Bud Light Lounge! Tickets are as low as $15! Call 508-365-1750 or click HEREfor a special ticket offer! The Railers Tavern, located behind the DCU Center provides hockey fans with a great pregame and postgame atmosphere all season long. Watch all road games broadcast live at Nonna’s (FRI, SAT, SUN) or Railers Tavern (MON-THU) or watch on ECHLTV.com for a small fee. Listen to all Railers games live on 98.9 Nash ICON with coverage beginning 30 minutes before puck drop with Eric Lindquist and Tom Matthews. Full season memberships, mini plans, and group tickets are on sale now by calling the Railers front office at 508-365-1750or by visiting www.RailersHC.com.